The Arquitectonica-designed SLS Brickell in Miami is the latest venture from mega-hotelier SBE (lead by Sam Nazarian) and top residential developers The Related Group (headed up by Jorge Pérez), in collaboration with creative partners Philippe Starck and José Andrés. After building up their trusted brand through hotels in destinations like Beverley Hills, Las Vegas and Miami’s South Beach, the SLS Brickell marks their first project combining a hotel with condominium residences. With 133 hotel rooms and 450 residences, the SLS Brickell sits at the heart of Miami’s downtown financial district, forming a prismatic glass pivot rising up from the meeting point of two central avenues, Coral Way and South Miami Avenue. Arquitectonica designed the building as a public jewel, lighting it up for the night-time with blue pin lights stretching from sky to street, marking the corners of the facade. With cultural destinations like the Pérez Art Museum Miami (PAMM) and Frost Museum of Science nearby, SLS Brickell has become a placemaker for Brickell – the developers designed restaurants and bars at ground level, looking to conjure a similar social dynamic to the lively hub of Lincoln Road. The triangular plan dictated angular geometric references across the architecture. Arquitectonica principal Bernardo Fort-Brescia’s favourite parts of the building are the trampoline triangular balconies: ‘They cascade diagonally off the facades like wind-driven rain, or are seen from the street like steps rising to the sky. Because they don’t align vertically, if one stands at their tip one floats over the street or looks up to the sky. One feels suspended in space,’ he says. 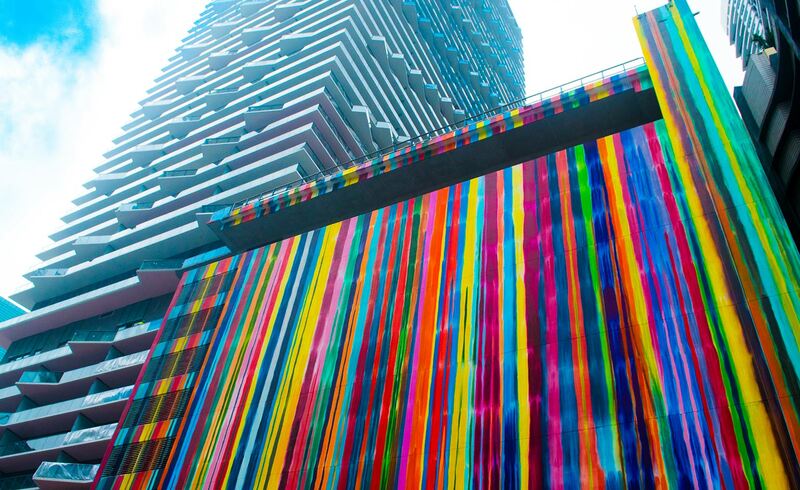 As well as the sharp, sleek design of the facade, distinguishing the project is an external mural by Markus Linnenbrink, his largest to date, which was chosen because of its vibrancy and reflection of Miami’s ‘colourful persona’. ‘From the very beginning of the process we knew we’d want a piece that would stop people and elicit a response from each and every one,’ says Carlos Rosso, president of The Related Group’s condominium development division. ‘SLS Brickell is a glimpse into the future of Brickell and the entire Greater Downtown Miami region. We brought the South Beach lifestyle to the middle of urban Brickell,’ says Rosso. Yet SLS Brickell is still full of its own personality and plays a new role in the city, says Arash Azarbarzin, president of SBE. ‘We always say SLS South Beach and SLS Brickell are great sisters; they help and complement each other, but they have different personalities. Brickell’s personality is more urban, while South Beach’s is more resort.’ The SLS Brickell features over 15,000 sq ft of meeting space, a spa and two pools, offering residents as well as guests the possibility of a luxury hotel-style living.